Court Yard Ristorante– Pesto Supreme: Grilled chicken, red onion, wild mushrooms, spinach, artichoke and tomato. 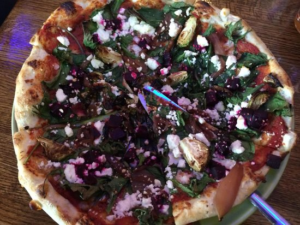 You can find this specialty pizza, Beet It, at the Fresh Palate downtown. The Cracker Barrel Party Store– Roasted Brussel Sprout & Applewood Smoked Bacon: House made tomato-alfredo sauce, topped with roasted Brussel sprouts, thick cut Applewood smoked bacon, and thinly sliced red onion. Add chicken for extra. Fresh Palate– Beet It: Beets, brussel sprouts, caramelized red onion, kale, feta cheese, and roasted garlic tomato sauce. Rosa’s Lookout Inn– Prime Rib: Sautéed onions and mushrooms, prime rib, and mozzarella cheese on a garlic butter sauce topped with asiago cheese and baked in a wood fire oven. Served with horseradish sauce for dipping. Black Sheep– The BLT Pie: Mayonnaise sauce, extra mozzarella cheese, muenster cheese, and topped with classic bacon, lettuce, and tomatoes. 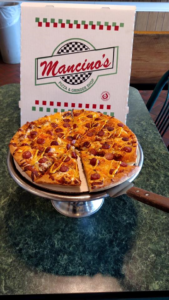 You can get the original Lud’s Coney Island in pizza form at Mancino’s! Komo’s Pizza– Bacon Cheeseburger Pizza: Ground beef, bacon, onion, and cheddar cheese blend. Long Lake Supermarket– Crab Rangoon Pizza: imitation crab meat, cream cheese, wontons. Mancino’s Pizza & Grinders– Lud’s Coney Island Pizza: Lud’s original Coney sauce topped with special cheese blend, cheddar cheese, sliced hot dogs, onions, and drizzled on top with mustard. JJ’s Steak & Pizza House– Chicken Florentine: Grilled chicken breast, baby spinach, artichoke hearts, alfredo sauce, and mozzarella cheese. John Boy’s Restaurant– Breakfast Pizza: Garlic Butter Crust, Sausage Gravy, Scrambled Eggs, Onions, Green Peppers, and Choice of Ham, Bacon, or Sausage. Freiers Pizzeria– Italla’noe: Pepperoni, ham, mild peppers, green peppers, red peppers, mushrooms, black olives, and anchovies. The Bulldog– Brand new to the menu, personal pizzas made to order your way! Legend has it that the first pizza originated in Naples, Italy and was created by Raffaele Esposito in 1889. His creation gained so much attention that he was called to cook a pizza for King Umberto and Queen Margherita. This particular pizza consisted of fresh tomatoes, mozzarella cheese, and basil and is still known as Margherita pizza to this day! 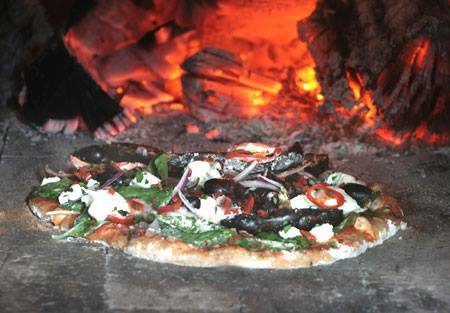 *Featured photo above courtesy of Rosa’s Lookout Inn, wood-fired pizza pie!